If you look at Palawan on a world map, it doesn’t take up much space, and at first I thought that it might be possible to cycle round the island in 3 weeks. But after reading how long the bus journeys were I realised that my plans were a bit ambitious and I’m probably not fit enough to get from one town to the next let alone around the island, so my next idea was to rent a motorbike. I tried to do a bit of online research before going but couldn’t find much except websites for a few bike rental shops, which were asking for around 600 pesos a day for a bike (50 Pesos = $1USD). I didn’t book anything and thought I would wait until I got to Palawan to work things out. Luckily the owner of my hostel in Puerto Princessa, had a couple of bikes (A scooter and a Honda VRM 125) that he rents out for 450 pesos per day. I asked him what his best price would be for 20 days expecting maybe a few hundred pesos off of the original price but he surprised me by letting me have it for 3000pesos for 20 days. The first day I got the bike I went for a little ride, which evolved into a plan to ride to Sabang – the site of the ‘famous’ Underground River one of the new 7 wonders of the world. I stopped a few times and took a few photos. It was tiring in the midday heat and I had only managed about 25km after around 3 hours of riding. I slipped on my sunglasses pondering whether to go back, whilst I sipped on a Pineapple juice, and caught site of my glowing hands, so red I could almost hear them. Decision made,………I rode back to Puerto and the nearest (only?) supermarket and bought a bottle of factor 60 sun protection cream, which still didn’t stop me getting burned somewhere new everyday – and if it had already been burnt, then it would just get burnt again. So with the understanding that I needed to protect myself from the sun, I set off the next morning for El Nido at 8 am. Hoping to make it to El Nido, then on to another resort called ‘Tapik’, in Sibaltan - which according to it’s website is one a half hours drive from El Nido. They also suggest that you don’t attempt it at night as the roads are quite bad. They fail to mention that so is the placement of roadsigns, lighting, and the sense of direction of most people that you are going to ask how to get to Tapik. The journey to El Nido, actually was much more of an enjoyable ride than I had expected following the previous day’s sweat and burn fest. One of the main reasons that I wanted to travel by bike was to have the freedom to stop where I wanted and take photos. I had to work out the most comfortable way to carry a backpack a camera and a larger backpack strapped to the back of the bike. I decided on the 70 – 200mm Nikkor lens, as I realised from my practice run the day before that it was better to have the longer lens to be able to pick up any scenes from afar, and if it is a car for example you have more of a chance to shoot it before it speeds off out of sight. Also working out the order in which to put things on took a while to get used to: bag, camera, helmet, in that order, otherwise it wouldn’t work. About 3 hours into the journey, after losing my new sunglasses during my first pit stop I arrived at Roxas – a small, dusty town where, judging by the reaction I got from the locals, few tourists seem to stop at. I bought myself a new pair of shades, filled up the bike at the petrol station and had a slap up fish lunch at a restaurant across the street. Back on the road, I was trying to figure out the best way to take photos whilst riding a motorbike. A few times I would see a car or tricycle I wanted to take a photo of, and would overtake it, and ride full throttle for a minute or so then stop and get my camera ready and try to snap it as it went by. I tried taking photos a couple of times whilst riding, but aside from being about as dangerous as riding with your eyes closed, the photos were also too blurry. As my petrolometer started to move towards ‘E’ for Empty I got slightly worried as I hadn’t passed any petrol pumps for over an hour. So finally decided to stop at a crowded bus stop and shot the question out to nobody in particular, and was told by the older people in the group to go back to a shop that I had just passed and I can buy it in litres (guessed they meant bottles). So I went back, filled up the tank and hit the road again, feeling relieved that I now knew where to buy petrol. It took about 3 bottles to fill the engine and about 3 refills to get from Puerto Princessa to El Nido, costing between 41 – 60 pesos per litre (around 50 pesos = $1). Aside from the friendly people and beautiful views that you get to see whilst riding a motorbike in Palawan, one of the less savoury and quite regular occurences was roadkill. On my first day I saw an inflated, decapitated cat, I have no idea how it got there and why there was no hole where it's head should've been. I also saw squashed dogs, flattened birds and mashed cats on a fairly regular basis, and even though I was travelling over 50 mph most of the time (so didn’t see all the gory details), I saw enough to give me some memories I won’t forget. Once I reached El Nido, I headed to Sibaltan, which as previously mentioned, was a bit tougher than expected. 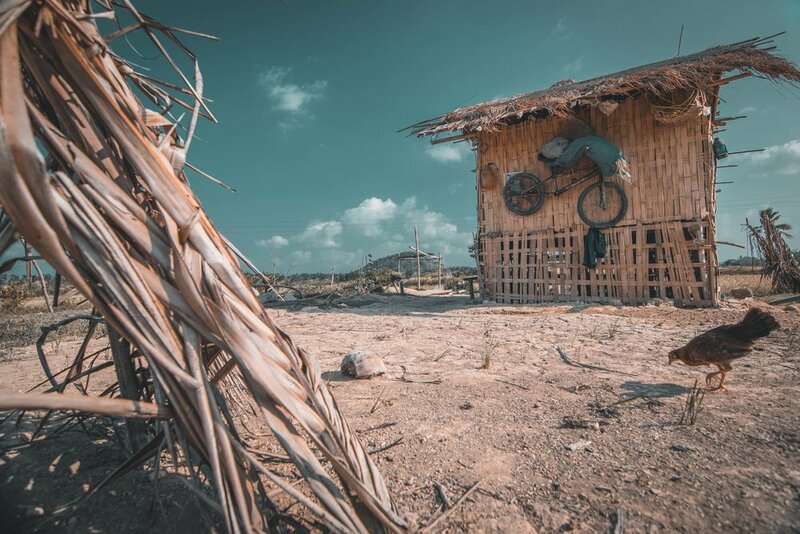 Most of the main roads in Palawan are paved, but all of the major resorts that I visited had at least a few miles of rocky, dusty dirt tracks leading up to them, the longest being 22Km at Port Barton. The final few kilometres to Sibaltan was when I really started to ask myself what I was doing. At one point I found myself riding up a steep, pitch black, unlit hill where the road turned to sand over a foot deep, with my bags hanging off the back of my bike precariously, my camera round my neck, and a herd of cows blocking half the road. I pressed on and after asking s few bewildered children where Tapik was, I eventually stopped at a house with a couple of friendly old ladies sitting outside, who to my delight, told me that I was about 5 minutes away. I arrived about an hour and a half later than planned, but was impressed that I'd actually made it. The Palawan landscape is actually quite barren and quietly eerie. The fields are usually empty and throughout my trip it must’ve been burning season, as charred hills started appearing regularly along the road. Other motorbike drivers seem to be fairly careful on the roads, which is more than can be said for the drivers of most of the 4 wheeled vehicles, but all in all it’s a fairly safe place to ride by South East Asian standards. Most of the photos on this page were taking whilst on the road. Most of the journey’s were fairly uneventful and the main distractions were the scenery. On my last journey back from Port Barton to Puerto Princessa, I was starting to hear my stomach calling for lunch when I passed what I thought was a busy restaurant, which seemed out of place, as I was riding through a village which didn’t seem to have that many houses or people in it. I turned the bike around after a bit of deliberation and as soon as I pulled up, a young Philippino guy who had clearly had a few early morning shandies, came and greeted me and asked me if I wanted to join them. As I walked into the area where everyone was (about 80 people in total), all eyes and ears were on us. A few people were heckling and almost everything this guy said was met with howls of laughter, and he seemed to be getting energised by it. It was all harmless fun…mostly at my expense. He led me to the food table, gave me a plate and told me to help myself to whatever I wanted and also piled a few things I really didn’t want on my plate too. I was really overwhelmed at the warm welcome I received. It wasn’t a tourist spot and it's experiences like this that you can get travelling off the beaten track and not just being on the tourist trail. This alone was worth getting the bike for. It was a great way to end my trip and made me realise that I had barely scratched the the surface with Palawan…..